March 23--ESDCTA Youth Benefit Fix-A-Test. The weather gave us a good day and we were able to host the ESDCTA Youth Benefit Fix-A-Test here at Rhythm and Blues. Linda Marciante of Bountiful Blessings Farm very generously donated her time for the benifit ofthe the ESDCTA Youth Commity. Linda's insights and hints were great. This was a very productive Fix-A-Test everyone made improvements and worked hard to apply Linda's fixes. Our first webinar opened to the wider horsy public was a resounding success!! People from all around the country joined us. Jeff was informative, interesting, and a real hoot. Although he was scheduled to speak for 2 hours he shot well past that mark, speaking for more than 2 and a half illuminating hours and even taking some questions at the end. He is very generous with his time and passionate about a logical and reality based approach to riding. The topic was "Rider Biomechanics" and we were all eager to hear what he had to say about a topic no rider can ignore. Jeff introduced us to the topic of rider biomechanics through the vocabulary of the subject. This was the perfect starting point as it explained many general concepts and gave us all a more exacting way to begin, to think about what we are doing on the back of the horse. Jeff provided an outline for everyone in advance of discussion and showed many illustrations as well as making physical demonstrations during the talk. Additionally Jeff had us in internet land try some fun and interesting exercises. I believe there are at least two more webinars on this topic so we look forward to scheduling our next webinar. Show Season is over and we haven't posted any news for several months. Congratulations are due to all Rhythm and Blues riders for a very productive and fulfilling summer. Everyone made great progress both within the show ring and at home. 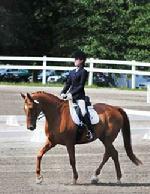 Amanda & Bacci Were back together in the show ring this summer showing locally and at Dressage for Kids over summer. They finished 4th in their division at Dressage for Kids. Madeline & Snickers Qualified for BLM & GAIG regional finals at 1st Level this summer and for ESDCTA finals at 2nd level where they were 5th. Additionally They were 6th in the 2nd level division at Dressage for Kids. A special thanks goes to Linda for all the help and support she provided as Heidi’s Scribe. Congratulations!! Hillary on the purchase of Pegasus Irishcream (Bailey). Good Luck!! Congratulations!! Madeline, for achieving USEF High School Varsity Letter status three years in a row.
! !Congratulations to all our Championship show Competitors!! Madeline Griffith and Amanda Perkowski had a great Show this year. Both finished in the top 3 of their division and scored consistently throughout the competition. The competition at the Festival is comprised of 3 different tests; written exam, dressage equitation class & a dressage test at the level the young person is currently competing. The scores from each of the components of the competition is averaged to determine placing. Amanda went into this year's competition working through a training hurdle, and put in a focused, steady performance working to keep Ducheneau (Spencer) straight, calm and confident. Amanda rose to the challenge and the results speak for themselves. 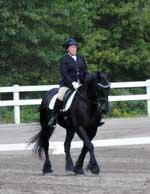 Madeline and Snickers continued their show season of consistent performances. Madeline has truly learned how to train and get the most out of this little paint horse. Madeline and Snickers hard work over the past year to produce, correct, quality work was evident throughout the weekend. We had a great time during the Luis Denizard clinic. He brought about great changes in all the riders and horses. He gave clear explanations along with meaningful images to improve the rider's understanding. We really enjoyed seeing old friends and meeting new ones. We are working to bring Luis back in July. He is a clinician not to miss! Linda Moeller and "Teddy" had a super first horse show together competing at Training Level with scores in the 60's. It was great seeing them out there! Amanda Perkowski and her new show partner "Ducheneau" owned by Lisa Taylor started their season off with a 68% in Tr. 3. Madeline Griffith and "Snickers" continued to master 1st 2 and 1st 3 with scores in the high 60's. Congratulations to all of our qualified riders and horses!!! Congatulations Hillary Horton and "Badlands Billy"
Hillary and "Billy" not only completed their first 3-Day, they finished 7th! Everyone at Rhythm and Blues is so proud of the endless work and preparation she put into making sure that Billy was able to effortlessly take on this 3-Day! She is a true horsewoman, not just a talented rider. He came home ready to chase "Teddy" around the pasture and show him just how fast he got to go during Steeplechase! We are Pleased to Announce that Elisa was awarded First Premium Hunter during the KWPN-NA Keuring at Iron Spring Farm (ISF) on September 8th. Elisa conducted herself with the same easy nature that she has been displaying during the past couple months of showing. She traveled great, stood for grooming and braiding like a pro and was a joy to handle in the show ring. We are certain Elisa will go on to an exceptional career in any discipline. We would like to thank Iron Spring Farm for hosting such a well run event and all the personnel at ISF for their hospitality. We would like to extend special thanks to Janko van de Lege for handling Elisa and showing her to her best. 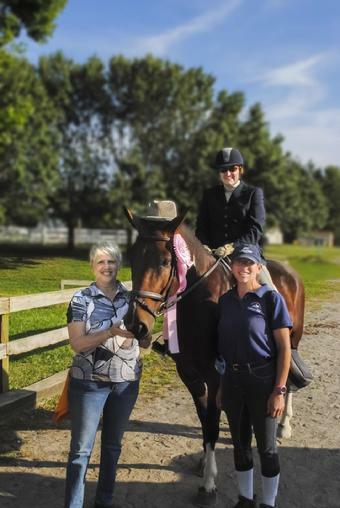 We had a super successful clinic with Ruth Hogan-Poulsen. She has an outstanding ability to see what each horse and rider needs the most, and then gives them the tools to improve and to continue working on until the next time she sees them. Super teacher with a great command of the biomechanics of the horse and the rider, who utilizes exercises to achieve the rider's goals. Click on picture to read caption. Congratulations Ashley, Madeline and Morgan! Jason and I would like to thank Ashley, Madeline and Morgan for their outstanding support of each other throughout the weekend. You were all super competitors and super people. We also would like to thank Tom and Danielle Griffith, Geoff and Lisa Maleson, Charlotte (I don't know her last name-but she came with Ashley as her groom and best friend) and Pam Harper for taking the time to support all the riders on the team and really for just being all around wonderful. 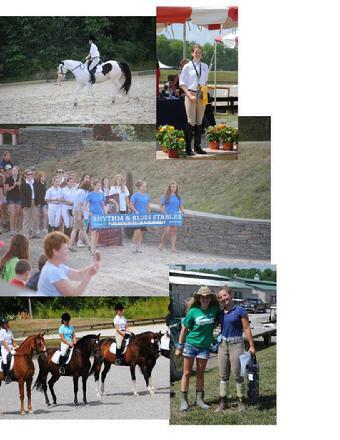 You all made this a great horse show where we all learned a lot and had a lot of fun! Congratulations Madeline Griffith and "Snickers"
Congratulations Amanda Perkowski and "L'il Miss Wendy"
Congratulations Mackenzie O'Brien and "Morning Glory"
Super riding at her first show!